Preheat oven to 325 degrees. Measure butter, milk, 1 c. sugar, eggs, baking powder, vanilla and 2 cups of the flour into a large mixer bowl. Blend 1/2 minute on low-speed, scraping bowl constantly. Beat 1 minute on medium speed, scraping bowl occasionally. Bake in center of oven until cookies are brown on the bottoms, 15 to 20 minutes. Cool on wire racks. Place tip of small knife in center of flat side of cookie. Carefully turn knife and rotate cookie to hollow, reserving crumbs. Mix 1 1/2 cups reserved crumbs, the jam, chocolate, nuts and rum. Fill hollowed cookies with crumb-chocolate mixture. Place 2 filled cookies flat side together to make a peach. Brush each peach very lightly with water. Immediately roll 1 side of peach in red sugar for blush. Sprinkle yellow-orange sugar on peach to cover completely. Set aside to dry. Roll gumdrops 1/8 inch thick on well-sugared board. Cut into leaf shapes. Make small hole in stem end of leaf. 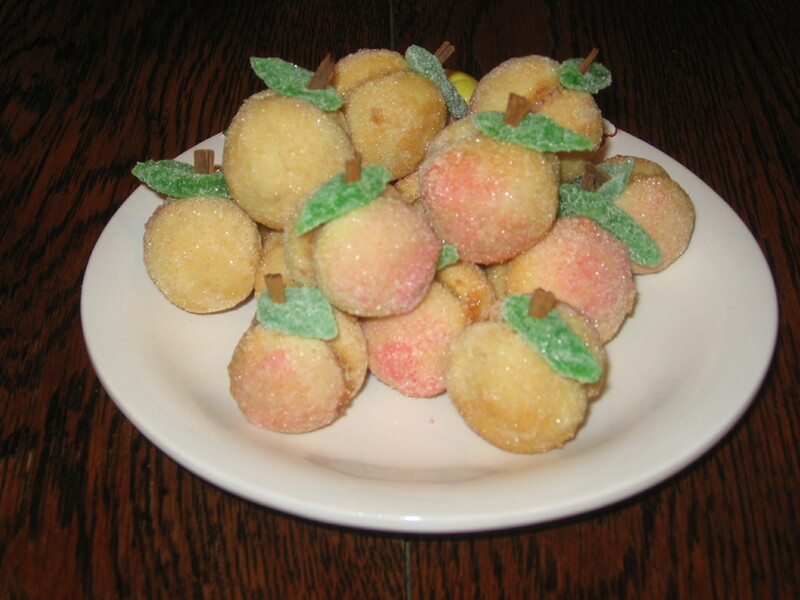 Insert small piece of cinnamon stick through hole in gumdrop and into seam of peach. Store in airtight containers at room temperature no longer than 2 weeks or in freezer no longer than 3 months. RED SUGAR: Measure 1/3 cup sugar into shallow ovenproof dish. Add a few drops red food color. Rub color evenly into sugar with back of spoon. Heat sugar in 400 degree oven until dry, stirring occasionally. YELLOW ORANGE SUGAR: Measure 2/3 cup sugar into shallow ovenproof dish. Add 2 drops of red food coloring and enough yellow food coloring to make peach color. Rub color evenly into sugar with back of spoon. Heat sugar in 400 degrees until dry, stirring occasionally. Combine first 5 ingredients in a pitcher; stir until sugar is dissolved. Stir in peaches and raspberries. Cover and chill 8 hours. Stir in chilled club soda just before serving. Frozen raspberries may be used. Peach flavored vodka may be substituted but omit peach nectar. 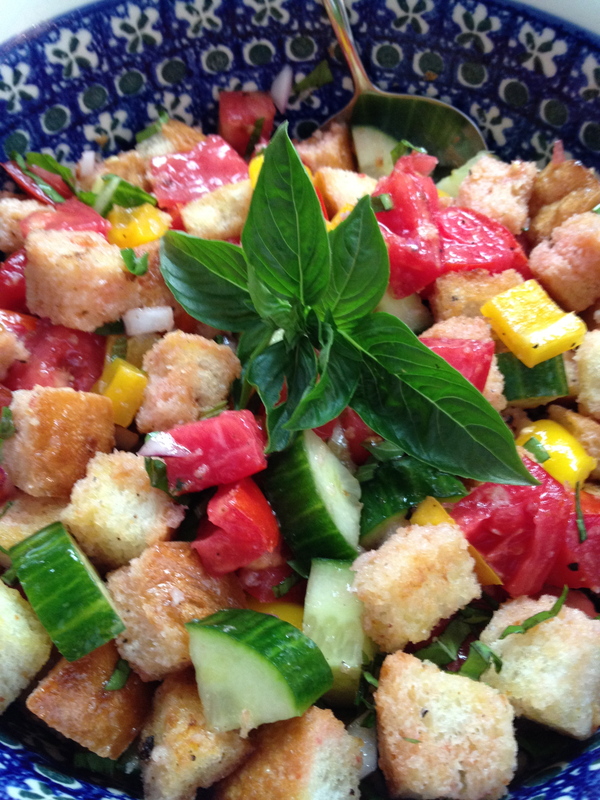 The recipe first made an appearance at Ivy Hill Farm in August 2013. Perfect after a long day working at the Peach Festival. Source: Southern Living, June 2010, original recipe name Carolina Peach Sangria. Place the nuts in a bowl. In a small, heavy saucepan over medium-low heat, warm the olive oil. Add the rosemary and stir until aromatic, about 1 minute. Pour the seasoned oil over the nuts. Add the sugar, cumin, salt, black pepper and cayenne and stir to coat the nuts evenly. Transfer the nuts to a baking pan. Bake, stirring occasionally, until the nuts are toasted, about 20 minutes. Transfer to a plate and let cool completely. 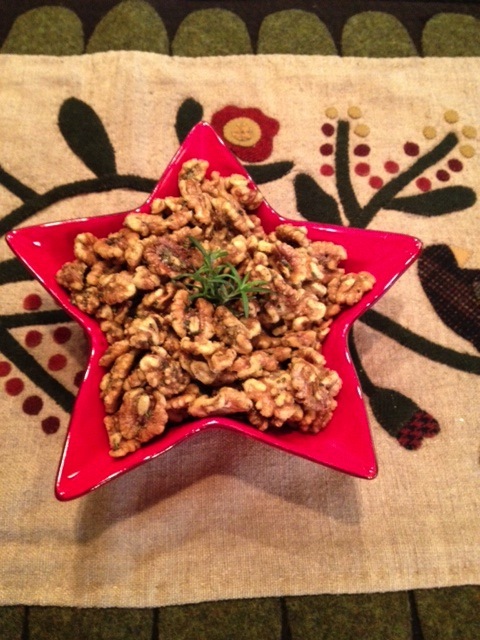 Store the nuts in an airtight container at room temperature for up to 4 days. Makes about 2 1/2 cups. Adapted from Williams-Sonoma Holiday Entertaining, by Georgeanne Brennan (Oxmoor House, 2007). Preheat oven to 425 degrees and butter a baking sheet. In a large bowl, mix together the flour, sugar, baking powder, salt, and baking soda. Blend the butter into the dry ingredients, using your fingertips or a pastry blender, until the mixture is crumbly. Add the orange zest, apricots and pecans (raisins or currants) and toss to combine. Add the buttermilk and stir until the dough is rough and shaggy. Gather the dough together and place on a generously floured work surface. Knead gently about 10 times. Divide the dough in half and pat each piece into a circle about 7 inches in diameter and 1/2 inch thick. To glaze, brush the circles with the heavy cream and sprinkle with the sugar. Cut each round into eight pie-shaped wedges. 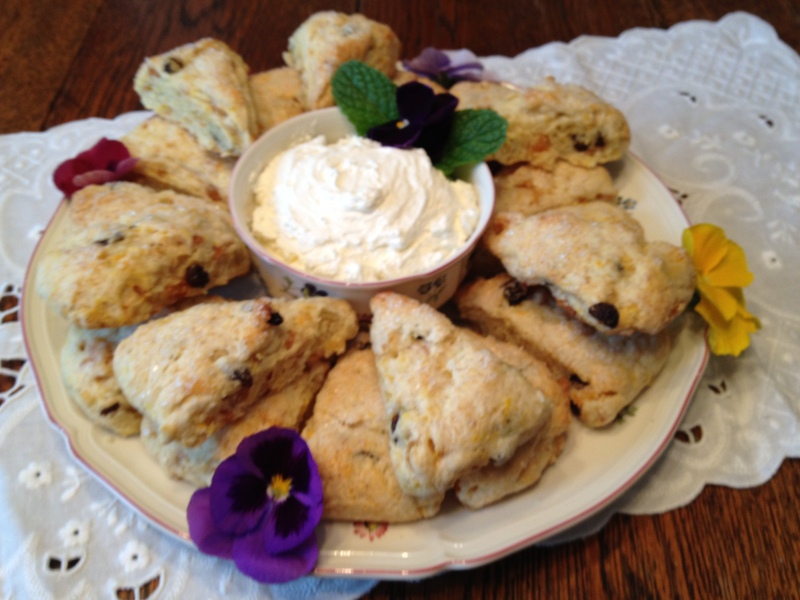 Place the scones, barely touching, on the prepared baking sheet. Bake until puffy and golden, 15-18 minutes. Directions:Heat the oil in a large saute pan. Add the bread and salt; cook over low to medium heat, tossing frequently, for 10 minutes, or until nicely browned. Add more oil as needed. For the vinaigrette, whisk all the ingredients together.